The 2009 pantomime at Eden Court, Inverness is Jack and the Beanstalk. This page will be updated with backstage news and insider gossip from both Imagine and the venue. Keep checking back for updates! 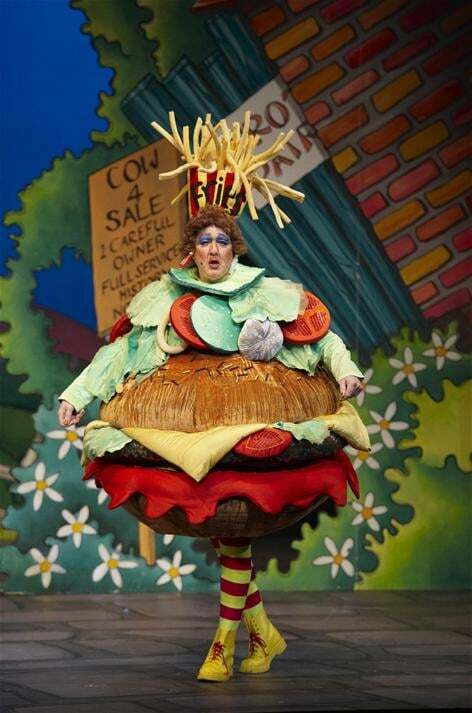 You can find lots more photos in our Jack and the Beanstalk Facebook photo album. "WHEN your ears start ringing, and you are at the stage when you almost can't hear yourself think for the screams of delight, you know you are on a winner. Jack and The Beanstalk, Imagine Theatre's first pantomime in Inverness, is just that, a surefire winner that had the younger members of the audience screaming with joy and bouncing like jumping beans having been wound up by the baddie, Fleshcreep, played for laughs by Connor McAllister. The classic fairytale of Jack Trott's valiant struggle to defeat the wicked giant who makes life tough for the Merrydale villagers, has had new life breathed into it with a fresh, lively look and fast-paced sketches, all served with a healthy dollop of laughter. The laughs come thick and fast via Iain Lauchlan, the show's writer and director and the chap behind the Tweenies, who plays Dame Trott and her youngest son, Simple Simon, played by Karl Woolley, the show's assistant director. The duo have worked together numerous times before and it shows – the two bounce gags off each like it's the most natural thing in the world. Audience participation features highly and pre-show, people can nominate a man in their life to take part in a messy sketch which sees Dame Trott and Simon have a bash at making their own version of an Inverness favourite, local baker Harry Gow's dream ring cakes. On Friday night, the “victim” was none other than former Dons footballer Brian Irvine, who even when splattered with cream, revealed he had lost none of the star quality he showed on the pitch at Pittodrie. With outrageous costumes, superb dancers, new songs, an amazing beanstalk and the cutest cow in pantoland, and a sprinkling of local references, this panto has it all, but there's more. The scenes with the giant are stunning, but to say any more would spoil the surprise for those yet to see this festive, magical show." Here are some production shots - click on the thumbnail to make the image larger. We will upload more onto our facebook photo album in time too! Take a listen to the radio advert for the panto! All the cast have arrived the theatre, and rehearsals for this year's panto are now underway! We're hoping to get photos etc through soon - when we do we'll upload them and share them with you! We've uploaded lots more 'behind the scenes' photos of the launch on our Facebook page, in the 'Inverness Jack' photo album. 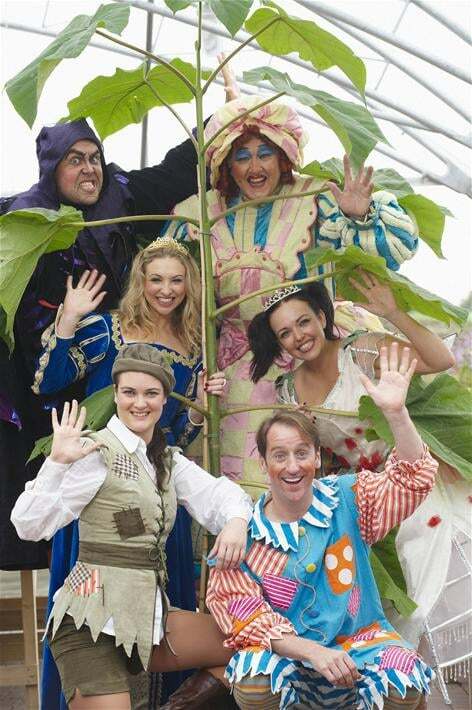 L-R - Iain Lauchlan as Dame Trott, Karl Woolley as Simple Simon, Katrina Bryan as the Fairy, Connor McAllister as Fleshcreep, Kate Robson-Stuard as Princess Tamara and Claire Waugh as Jack. Sunday 6th September saw the babes auditions take place at Eden Court, and the turn-out was fantastic. Over 180 children turned up to try their hand for a part in the pantomime. The auditioning panel was Iain Lauchlan (Dame and panto director), Jane Howie (Choreographer) and Louise Redmond (Imagine). The decisions were extremely tough, but in the end three teams of eight plus six reserves were chosen. Well done to all who took part, and thank you for attending. Well, Panto time is approaching like a number 52 bus with faulty brakes!! And pre panto preparations are underway. Our esteemed Director Iain Lauchlan, creator of the Tweenies, Jim Jam and Sunny, Boo and Fun Song Factory is preparing for the gruelling rehearsal period by stocking up with Scotch pies, white pudding, shortbread and Irn Bru. The cast are also using their time wisely. The Giant is getting a new pair of Jimmy Stew Boots. They are size 324 and a half and being built on Clydeside. They will then be floated up the Caledonian Canal to Inverness ready for his fitting. Fleshceep is taking baddie lessons and has filled his underpants with thistles, lucky heather and some gravel just to make him a bit more miserable and give him something to whine about. Princess Tamara is bathing in Haggis milk to improve her skin and I…well I have had a new corset being built at Invergordon with some of the steel girders they had left over from the oil rigs. Well….That’s about it for now. Keep smiling. Here is the pantomime poster. The team from Imagine visit the venue and meet the venue team for the first time! Steve Boden, Sarah Boden and Iain Lauchlan spent two days up in Inverness, meeting all the theatre staff, talking about the show plans, demonstrating set models, planning outreach programmes, marketing etc etc. It was a great couple of days and the venue staff are lovely and welcoming. We are so looking forward to working with them. Thanks for making us so welcome on our first big visit, Colin, Roz, Laurie, Bob and all the team. We can't wait to work with you. Here are some photos of our visit and of the beautiful venue. Outside the venue and (right) Steve and Iain outside the theatre. Imagine is coming to Eden Court, Inverness! Imagine is absolutely delighted to announce that we have just been awarded the contract to produce pantomime at the beautiful Eden Court Theatre in Inverness. The 2009/10 production will be Jack and the Beanstalk.